Inspired by that famous fairy! I hope you like this pattern. 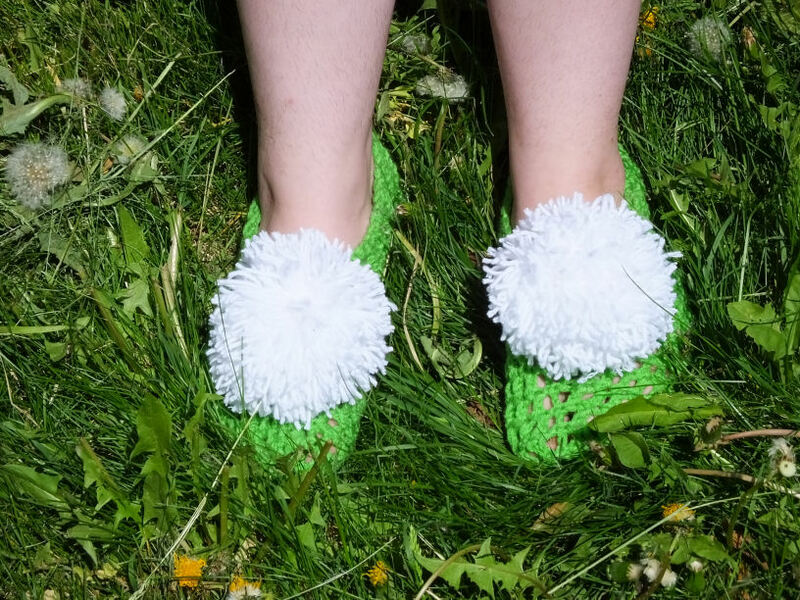 It was a lot of fun to make and now I have great big pom poms to wear on my feet. My feet are size 7.5-8. The same slippers are shown on my daughter's size 8.5-9 feet at the end. These slippers are sized for medium sized women's feet, but the pattern can be adjusted easily. Adding a round in rounds 4-6 or a plain row will make them longer. Starting with 12 stitches instead of 10 will make it a little deeper, and adding a couple chains in round 1 will make it bigger around. You can also start with less stitches to make them smaller. However for all those methods- you'll have to rework the decreases to space them evenly to get a custom fit to your foot. For just a little off- say a size 10 rather than an 8 or 9- moving up a hook size will work, or for a size 6 or 7, move down a hook size. Worsted weight yarn- I used Red Heart Super Saver in Spring Green and Red Heart Shimmer in Snow. dec dc= decrease double crochet, yarn over, insert hook in stitch, yarn over, draw up loop (3 loops on hook), yarn over, pull through 2 loops, (2 loops on hook), insert hook in next stitch, yarn over, draw up loop, yarn over, pull through 2 loops, yarn over, pull through 3 loops. First row is worked in the sides of the reinforced chain. Break off yarn leaving a tail. Weave the tail into the last 10 stitches, and cinch them down. Knot off the tail, weave it in and trim. Join yarn at heel, sc around the top of the slipper, sl st to join, break off and weave in ends. To make the large pom poms, I held my fingers slightly apart and wrapped the glistening white yarn around 4 fingers 150 times. Then used a 12 inch piece of the same yarn and threaded it through my fingers, because my fingers were slightly apart it was easy to slide it through, and tied it off in the middle. Carefully slip the yarn off the fingers, adjust the tie if it needs it, and knot down firmly, then wrap the tie piece around it again and knot again, and repeat. Flatten the bundle into a little round disk, and cut open all the loops. Trim into a circle while holding it flat. Fluff it out and trim to make round. Stitch the pom poms in place with the tails on the 3rd row from the top opening and centered on the front of the slippers. Reasons? I'm looking forward to hearing them if you'll tell! They're lovely. Love the giant pom poms.